"(GREENSBORO, NC) Greenhill announces the 2015 summer exhibition, Jonathan Brilliant On-Site, on display June 19 – August 30, 2015. Curated by Edie Carpenter, the exhibition is the first major exhibition in the Triad of the constructed environments of Raleigh-based artist Jonathan Brilliant known for his labor intensive installations. Brilliant’s installation at Greenhill will be a modification of his coffee shop themed installations entitled “Have Sticks Will Travel: World Tour,” a marathon series of site-specific installations that have taken place in 13 galleries over 18 months, in three countries, and on two continents. Brilliant has utilized repurposed materials sourced primarily from coffee shop culture – composing his palette from disposable wooden stir sticks, iced coffee straws, paper cup sleeves and plastic cup lids. He explains, “In this ongoing series of work, I now continue to explore my sense that the coffee shop and related consumer environs are more organic and nurturing than the ‘real’ natural environment.” At Greenhill, Brilliant will develop a focused site-responsive work centered on the unique features and architecture of The Gallery at Greenhill. 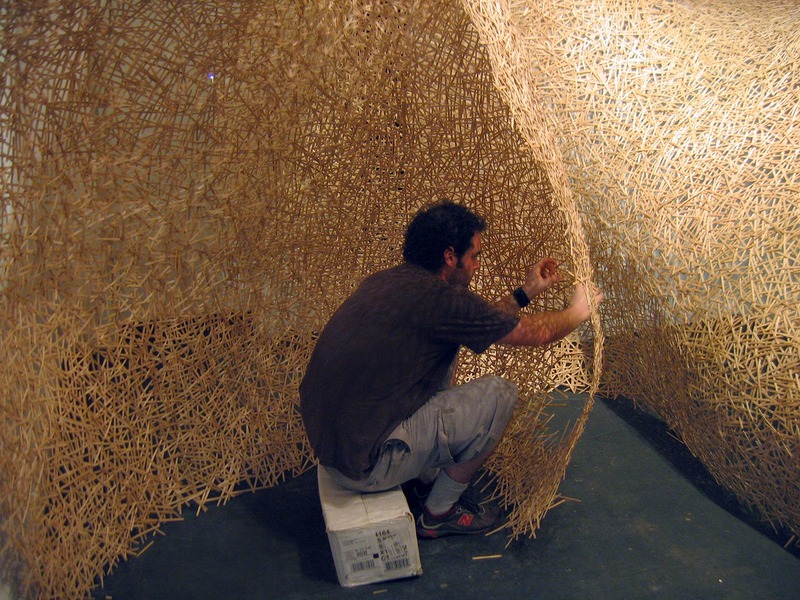 The installation, containing between 30,000-50,000 stir sticks woven in place entirely with tension and compression with no adhesive, creates an uncanny sculptural environment for the viewer, resulting in a unique experience for onlookers where they are quite literally immersed in an environment created from nothing but the repurposed materials from everyday life. While on site he will create a dynamic and engaging installation reflecting his interests in the effects of labor, performance and materials applied to an exhibition space. During the first ten days of Jonathan Brilliant On-Site, visitors will observe firsthand the construction and evolution of Brilliant’s immersive environment during open artist “residency hours”. The open artist residency hours (12-2pm each day from June 23-27, 2015) give the artist the space and freedom to create something unexpected not only for himself but for Greenhill audiences as well. The site-specific work will be constructed in at least one-half of Greenhill’s expansive 7,000 square foot gallery, with its high ceilings, bamboo flooring, abundant natural light and a front window looking out on a public city park. Brilliant incorporates elements specific to each site in the conception of his work and in The Gallery at Greenhill, housed in the former front offices of the old News and Record building, the artist was particularly taken with the ceiling’s decorative plaster egg and dart moldings and the four concrete columns that divide the gallery. He will use the moldings as inspirations for patterning and printmaking and use the columns as support for his monumental tensile structure. Greenhill’s exhibition also includes works on paper and smaller assemblages with large mono-prints made from ferrous metal objects and crates enclosing 3-d structures. Laura Way, Executive Director explains, “Greenhill, has presented an exceptional range of exhibitions in the past 41 years, but rarely do exhibitions include site-specific, installation-based work that has this level of artist response to the environment and audience engagement.” Once constructed, the work will be the center-point to myriad activities for adults and children and families through ArtQuest, Greenhill’s education program. ArtQuest Summer camps have been developed to take advantage of the installation’s sense of fun and whimsy as well as the art, science and engineering that it took to construct. Brilliant will lead an artist talk and conduct a teen workshop. The actual deconstruction at the end of the exhibition will be as lively and interactive as the construction. Greenhill envisions a contest to find identify the lucky one who gets to pull the right stick that sets the entire installation a tumbling down. “How audiences interact with art, and how they define art is shifting and evolving as quickly as one can capture an image on Instagram, and it is incumbent on Greenhill to embrace changing realities of how art is viewed, received and perceived. With this residency for Jonathan Brilliant, Greenhill will establish a defined practice within its artistic program of incorporating an active audience participatory exhibition model into the curatorial matrix,” Way said. For more information about the exhibition visit www.greenhillnc.org/jonathan-brilliant-on-site. Residing in Raleigh, NC, Jonathan Brilliant received his B.A. in studio art from the College of Charleston and an M.F.A. in Spatial Arts from San Jose State University. He has received numerous fellowships to artist residencies and communities including: McColl Center for Visual Art, The Ox-Bow School of Art, The Vermont Studio Center, and The East/West Project in Berlin Germany. He is a recent recipient of an individual artist grant from the Pollock-Krasner Foundation and the South Carolina Arts Commission 2011-2012 Visual Arts Fellow. Installation artist and guest speaker Jonathan Brilliant will have a conversation about why nonprofit visual art organizations are critical to the creative development and career path of the artist. Follow on-line or participate in person in the construction of Jonathan Brilliant’s immersive installation made from disposable coffee products. During "open studio" hours the artist will be available to answer questions, demonstrate construction techniques and share his progress with the public. Throughout the exhibition visit our hands-on activity station in The Gallery where people of all ages can explore the same coffee house materials used in the exhibition. Work with Jonathan Brilliant from 11:00 am -12:00 pm on his gallery installation; have lunch and move to the studio to explore a “pressless” printmaking process involving ferrous metals and simple household products such as vinegar to capture "rust prints". North Carolina artists are invited to present 15 works to Director of Curatorial and Artistic Programs Edie Carpenter and Director of Programs Lynn Sanders-Bustle. Join us for First Friday and live music by the Piedmont Regulators from 6:30 - 7:30 p.m. The Piedmont Regulators is a high energy string band from Hillsborough, NC. While mainly focused on music made around the 1920's, their style is influenced by a wide range of artists, from Appalachian Old Time to New Orleans Jazz, from Texas Swing Bands to Memphis Jug Bands. They guarantee every performance a visceral experience that will have you toe tapping, knee slapping, and hand clapping for more. Jonathan Brilliant On-Site Closing Party, August 26, 2015, 5:30-7:30 pm "